Everyone dreams for a perfect world but in the present system of things, this dream remains of dream. Yet, nothing is wrong to keep on dreaming because realism starts with a dream. As we all strive to grab hold of a better country, many of us have amazing ideas on what we can do for a better Philippines. Some of them may be trivial while others are already tasks that some of our countrymen are performing but are not just that perfect to achieve a perfect output. What can we do then to make this country a better place to live in? What gift can you wish for the Philippines? Happiness. It is one thing that every person wants to feel. It is something bright and gay that happens deep inside us that make it possible for us to exude such light even to other people. Happiness is that joy in a child’s eye when his parents come home with a pasalubong, it is the warmth in an old man’s smile who sits on the streets begging for alms when someone drops a coin on his can, it is the victorious hooray from an athlete who have garnered a gold medal in representing the country or of a beauty queen who grabbed the crown of glory, it is the satisfaction of every mother who sees her family happily consuming the healthy meal she prepares for diner, it is the contentment of every father who gets a kiss on the cheek from his wife when he gets home tired from work and a hug from his kids who would even take off his shoes and socks, it is the fulfillment a seller gets when all her paninda in the market is sold out, it is something that varies in each and every one of us but it is something that we all yearn to feel. Happiness is what I wish for the Philippines because it can move mountains. From happiness comes love and hope. When our place was hit by Typhoon Yolanda, we were never hopeless. I can see that my fellow Waraynons can still manage to smile despite our terrible experience and despite our loss. We have lost materials things and others have lost loved homes. Many do not have shelters and were merely sleeping on the streets with the wind as their wall and the sky as their roof. Many do not have food to eat and were merely relying on relief goods. We have cans and cans of sardines but instead of griping about receiving the same goods all the time, the Waraynons invented and discovered so many new ways to cook sardines. And yes, we all managed to smile and help each other. It is those smiles that keep us going. Despite the gloom, we can sense a little light in each and everyone of us. From that little happiness, we held each other’s hands so we can move forward and build a better city. Happiness helped Tacloban, Palo and other places in Leyte and Samar to slowly stand from the great downfall. If it did miracles to small towns and cities, then it can make miracles to the entire country and the rest of the world. Yes, everything just begins with a single smile for our country, for our world to become a better place. Time will come that our dream of a perfect world will be right before our eyes as long as we live according to God’s standards and as long as we patiently wait for our perfect world to arrive. For the moment, let us seek our own happiness, let us give the gift of SMILE and the rest will follow. This post is an entry to a blogging contest in answer to the question : “If there is one thing you can give to the Philippines, what is that gift?” of the #GLOBEProjectWonderful2014. How about you, what would you give the Philippines? 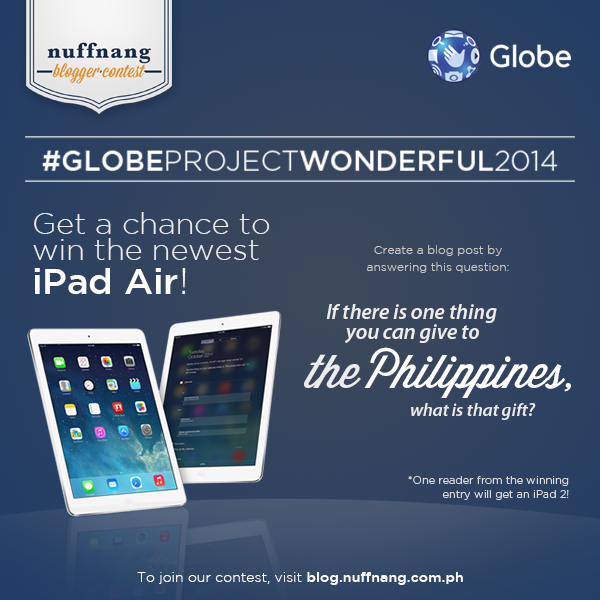 Drop in your comments and get to win an iPad Mini 2 for the best answer to be selected by Globe. This Is So Very True, I Wish We Did It Here In The U.S. More Often I Do All The Time!!! I would wish for a peaceful soul for them. I will do my best to use my education and life experiences to help the less fortunate people of the Philippines as much as i can.. Everyone needs a chance to improve their lives.. If i can help them, then i have really accomplished something! I want to inspire them to do better and give them more of a sense of direction in life..